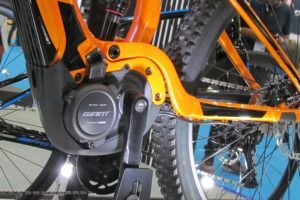 BERLIN, Germany – The e-bike market in Germany is growing at record pace. The newest 2017 data from industry association ‘Zweirad-Industrie-Verband’ (ZIV) clearly underlines that e-bikes nowadays in Germany are, next to a preferred mode of mobility as well as for leisure and sports, also a clean, quiet and space-saving alternative for city logistics. 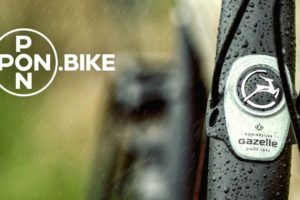 In 2017, 720,000 e-bikes were sold in Germany. With that total sales increased by a big 19 percent. It makes that currently one in five bikes sold in Germany is an e-bike. The e-bike share in total bicycle sales stands currently at 19 percent. 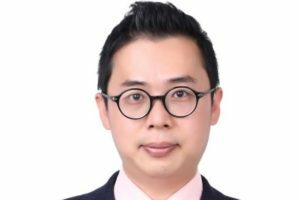 ZIV expects that share to grow further in the next years; in the medium term to 23 – 25 percent, representing a total sale of close to one million units. 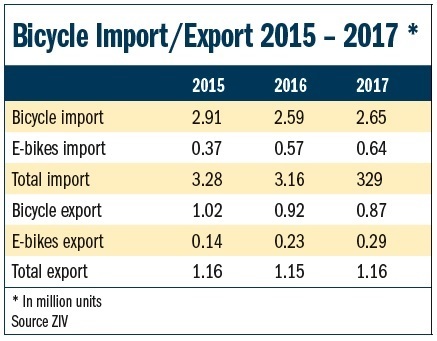 ZIV’s long term expectations call for e-bikes to grow to a 35 percent market share, or a total of 1,350,000 units. While the weather was relatively good for cycling and with that cycling sales, ZIV also mentions the cars emission scandal and the impending driving bans in cities as a driver for people to turn to bicycles as an ideal means of transport on short and medium distances. On what e-bikes are sold in Germany ZIV states that about 99 percent are 250W/25 km/h models. 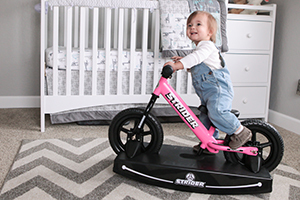 About 1 percent are speed pedelecs; the 45 km/h models which must be type-approved and for which a helmet and insurance obligation applies. 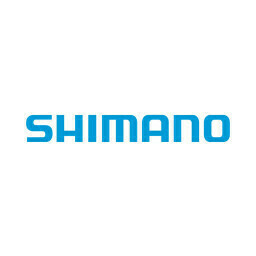 Furthermore; breaking down the 99 percent of 250W/25 km/h e-bikes then it shows that e-City bikes have a 38.5 percent share in total sales; E-Trekking stands at 35.5 percent, e-MTBs at 21.5 percent and e-Cargo bikes at 3 percent. Meanwhile the e-bike’s market share increased to 19 percent. 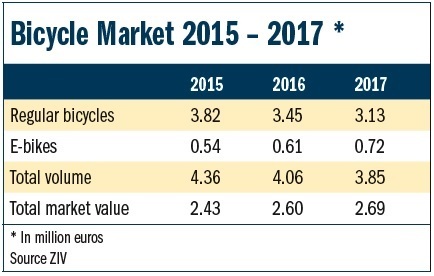 In the medium term, ZIV is thus correcting its forecast to an expected 23-25 percent share of the overall bicycle market. In the long term, market share could reach up to 35 percent. 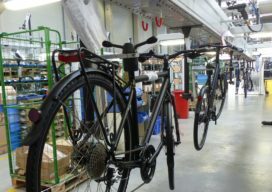 ZIV notes further that ‘Made in Germany’ e-bikes continue to be in high demand. 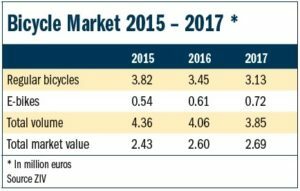 The country’s bike makers exported 291.000 e-bikes in 2017; up 25 percent compared to the 2016 export total. Contrary to the positive market results, the volume of Germany’s regular bicycle production declined substantially in the past years. Compared with 2015, the volume went down by one third or 620,000 units to 1.26 million bicycles. 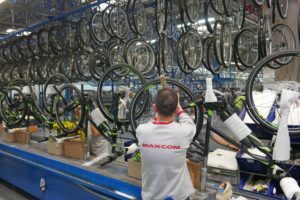 Even the 50 percent increase in e-bike production from 310,000 units in 2015 to 470,000 units last year could not compensate this decline. The import of bicycles to Germany hovered around the same level as in 2016 at 2.65 million units. Cambodia is still at the top as main importing country in Germany with 23 percent of all regular bicycles or 885,500 units. Number two and three in the ranking are Poland with 13 percent and Bulgaria with 11 percent. 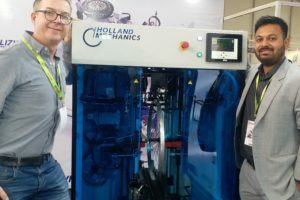 The category e-bike shows a completely different picture: the main exporter to Germany is Hungary at 22 percent of the total volume, followed by China and Vietnam (both 16 percent). 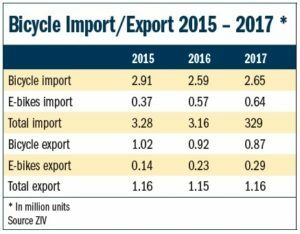 The e-bike import was up 12 percent from 570,000 units in 2016 to 640,000 last year. On export level, the popularity of German e-bikes abroad does compensate for the loss in volume of regular bikes. The total volume of bicycles and e-bikes together has been approximately 1.15 million units although the e-bike share increased substantially to 25 percent in 2017. Germany’s e-bikes are most wanted in the Netherlands who bought 24 percent of Germany export volume or 69,600 units. The second largest market for German e-bikes was France at 16 percent.